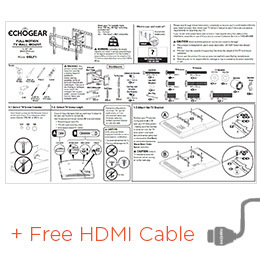 Mount your TV with this Amazon Best-Seller. Arm day? Erryday. 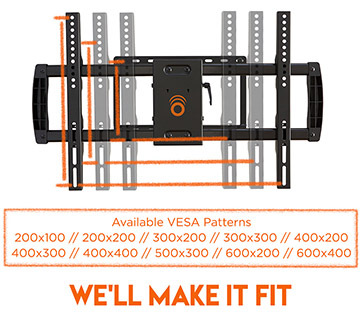 This steel beast easily supports screens up to 70" & 132 lbs. Pull it out (up to 16") , pack it in (sits just 2.6" from the wall, let it begin. Couch. Bed. Other side of the couch. 130º of swivel allows watching from wherever's most comfortable. The glare's gotta go! Kill it with fire. 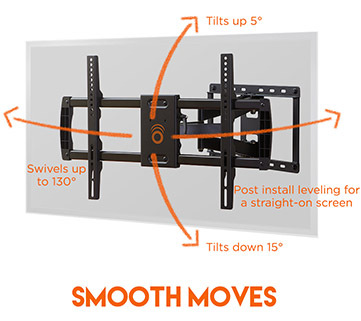 Or more effectively, with 15º of effortless, tool-free tilt. LG TV? Sony? Vizio? Samsung? Swipe right. 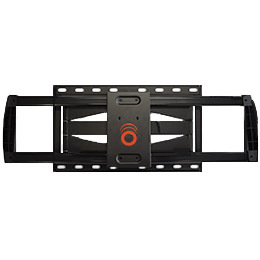 Universal mounting bracket is compatible with all major TV brands. 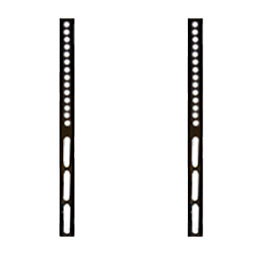 30-minute install on 16" studs thanks to included, pre-divided hardware. No seriously, we timed our interns. We have one job: To make yours easy with uncomplicated instructions and responsive customer support available 7 days a week. Humble Brag: this mount is UL listed, which is a fancy sounding term that means we tested it to safely hold 4x the listed weight limit. Smooth moves! Extend, tilt, and swivel large TVs. You’ve finally got a 65” beauty of a TV. Why limit it’s functionality by leaving it sit on the cheap plastic stand it came with? 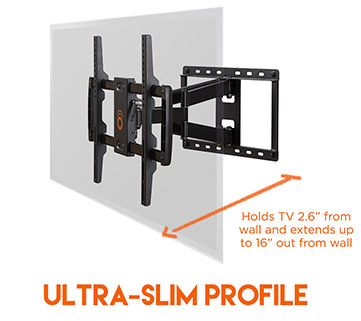 With a large full motion TV mount, you can extend, swivel, and tilt to your hearts desire, all while keeping your TV (and family members) safe. 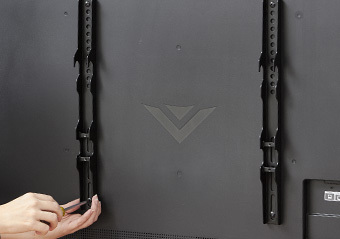 Because large full motion TV wall mounts are bolted to two studs, they can hold more weight than their single-stud counterparts. Ours can easily hold 132lbs, and we’ve tested it to hold 4x that amount in our top-secret lab in Minneso…I mean what lab? Newer large LED and LCD TVs weigh around 45lbs, so long story short, your TV is safe with us dude. If you’ve taken the advice of every person on HGTV, and now have an open concept living space, full motion is definitely the way to go. It enables you to effortlessly turn the screen to wherever you want to watch with patented “smooth as butter” technology. From binge watching Netflix on the comfy couch in the corner (don’t mind the stains), to keeping up with Bobby Flay while in the kitchen, your TV can be pointed anywhere you are. 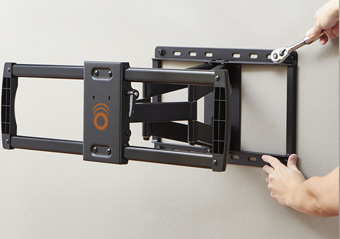 If you need to mount your TV in a corner, full motion is a must. 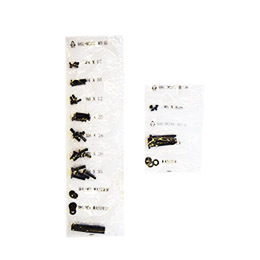 We would recommend a single stud full motion mount, see it here. “OMG! If you are looking for a super high quality articulating mount this is it. Look no further. I love this mount and will only use Echogear mounts going forward.” -Brenden C.
Show about to start? With our easy 3-step install and expert customer suport, you'll be back on your couch in no time. 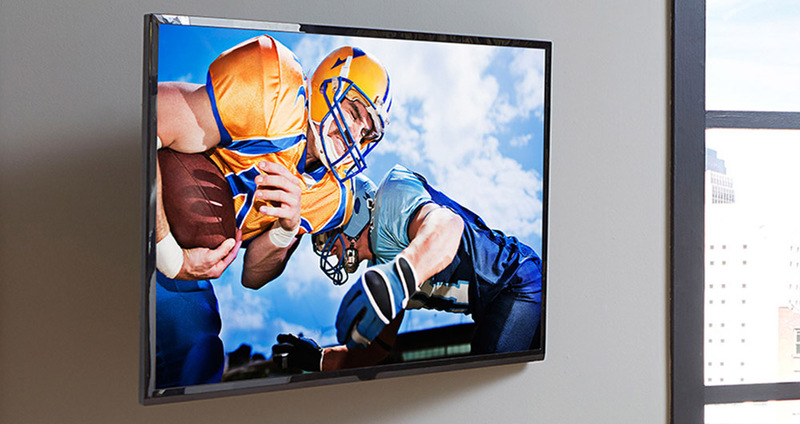 Click the button below to add the Full Motion TV Wall Mount for 37"-70" TVs to your wish list.